Duncan will introduce the day and speak about the benefits of building with locally sourced non-toxic, organic materials within the context of huge amounts of toxic plastic waste choking our natural ecosystems and infiltrating our food chain via the five huge ocean Gyres. He will explore the challenges ahead of us in creating healthy buildings and managing toxic waste materials. 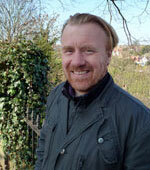 Based in Lewes, Duncan Baker Brown has been a director of award-winning architects BBM Sustainable Design since 1993. 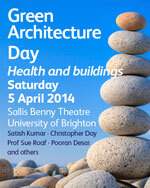 He also teaches and researches around green ideas at the School of Architecture in Brighton. He has had the good fortune to work on some of the UK’s most high profile green developments such as The Greenwich Millennium Village, the RIBA’s Futurehouse and The House That Kevin Builtwith Grand Design’s Kevin McCloud. Apologies, this talk has been cancelled. Community orchards enliven grassy and unused urban spaces. They provide healthy affordable food to those who get involved as well as exercise. Providing a focus they can bring people together building communities and perhaps reducing antisocial behaviour. They are a place of learning where people can acquire skills and build confidence. And, of course, they provide habitat for the birds and bees. 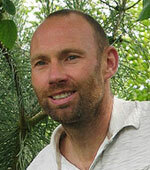 Bryn Thomas has co-managed Brighton Permaculture Trust’s community orchard planting programme for the last five years. With its partners, Brighton Permaculture Trust has helped plant over 90 school and community orchards with around 1000 fruit trees. Peter will define what a good home is, and highlight the aspects of good homes that contribute towards physical health. Pete Halsall , MD of EcoVentures, is a sustainable community developer, with a background in property development, construction and environmental engineering. He was co-founder and managing director of BioRegional Quintain Ltd., where he successfully led the company in securing developments at Middlesbrough (development agreement with EP) and Brighton (JV with Crest Nicholson). Pete is passionate about regeneration, sustainability and architecture. He is a graduate of Bath University and has worked in the UK, Spain, US and China. Christopher will describe his journey from artistic design to health-giving place-making – for people, place and planet; physically, psychologically and spiritually; technically, socially and ecologically. A journey from geographically-limited theoretical knowledge to experience-based universal principles sensitive to local circumstances. Throughout his slideshow, he will answer questions through interactive media. Christopher Day trained as an architect and sculptor. In addition to designing buildings in accordance with his ecological principles, he offers worldwide consultancy on the development and the rescue of places both indoor and outdoor. His projects have won several awards, including a Prince of Wales award. He is the author of Places of the Soul, Spirit & Place, Consensus Design, and Environment and Children. The Waste house is one of the first A* energy-efficient rated buildings in the UK. It was built almost entirely of waste materials, including thrown-away bricks, ply sheets and wood plus old toothbrushes. It showcases new technologies and will be used as an exhibition and workshop space by local community groups and as the University of Brighton’s headquarters for sustainable design. Sue and Pooran will share some of their experiences collected over 15 years of BioRegional’s work with partners to build sustainable communities, as well as helping developers around the world conceive and construct their own One Planet Communities. Sue also worked at a national level on EcoTowns and now BioRegional are an integral part of delivery of the North-West Bicester EcoTown being constructed by A2 Dominium. What opportunities and challenges might the government’s support of Garden Cities now bring? 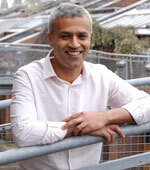 Pooran Desai studied at Oxford and Cambridge Universities before co-founding BioRegional Development Group in 1995. 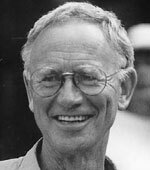 Initially he worked in sustainable forestry, helping develop the concept of ‘bioregional network production’ and founding BioRegional Charcoal Company Ltd. In 1997 he initiated the BedZED project, contributing through design, construction and monitoring – which in turn led to the Z-squared and One Planet concepts. Pooran is included in Building Design’s top 50 green leaders for 2012. Sue Riddlestone is Chief Executive and co-founder of BioRegional, an international, award-winning social enterprise and sustainability charity which she co-founded with her husband Pooran Desai in 1994. Sue is also a co-creator of BioRegional’s One Planet Living framework and ten principles, drawn from practical experience in developing the BedZED eco-village in Sutton, south London, where BioRegional is based and Sue and Pooran live. 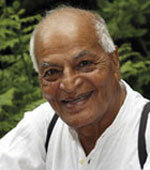 When he was only nine years old, Satish Kumar renounced the world and joined the wandering brotherhood of Jain monks. He left the monastic order and became a campaigner for land reform, working to turn Gandhi’s vision of a peaceful world into reality, before undertaking an 8,000 mile peace pilgrimage. Since 1973 he has been editor-in-chief atResurgence & Ecologist magazine, and his books include No Destination, You Are Therefore I Am, Spiritual Compass, and Earth Pilgrim. Satish teaches, lectures and runs workshops on reverential ecology, holistic education and voluntary simplicity. Please note that the sound quality varies. It is becoming ever clearer that we need to be designing resilient buildings, cities and citizens for the 21st century. We need to run buildings increasingly on local energy, treat the climate and the people in the building as part of the solution, not the problem and design buildings that are adaptable to different weathers and safe even in very different future climates. 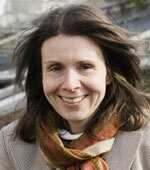 Susan Roaf is Professor of Architectural Engineering at Heriot Watt University. 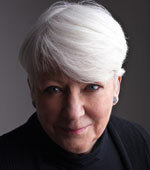 An award winning teacher, architect, solar pioneer, author and speaker. She is an ex-Oxford City Councillor and has worked on ecohousing, thermal comfort, building integrated photovoltaics, traditional technologies, water-efficient, low carbon and resilient design, adaptation to climate change and Solar Cities. Her PhD was on the Windcatchers of Yazd. Resurgence & Ecologist will be selling books and magazines. Brighton Permaculture Trust will be selling eco materials and advertising up-and-coming courses and events. Eco Open Houses will be publicising the April Eco open houses event in Worthing and Steyning. Brighton Energy Co-op will be advertising their latest share offer for community energy.